I first reported on this issue prior to Pesach, when Chief Hakham Moshe Firrouz was interviewed by an Israeli news service. And today, I catch up with Tomer Mangoubi, author of Mikdash Me’at, who was inside the Israeli Supreme Court during the hearing. Just so we are all aware of what’s at stake: If the Rabbanut is allowed to withhold Rabbinic certification from meat slaughtered in the same facility as Karaite meat, then these facilities can be expected to close their doors to Karaite slaughterers so as to continue to cater to the much larger Rabbanite community. And it is hard to believe that the Rabbanut’s motives here are pure; they announced this policy right before Pesach, a time when the Rabbanut’s change of policy would cause the greatest impact on Karaites. Tomer graciously provided his thoughts and impressions of the hearing. However, he also cautions readers that he is not an expert on the Israeli legal system and that he is not a native Hebrew speaker; so there may be some subtleties he was not able to glean. So, with those caveats aside, here are some questions I posed Tomer and his corresponding thoughts. What is the current situation with respect to Karaite shechita in these independent facilities? Prior to Passover, the Rabbanut issued an order seeking to prevent Karaite slaughter in these independent facilities. The Karaites appealed the Rabbanut’s order. For various legal reasons, the status quo from before Passover is still in place – that is, Karaites can currently slaughter in these private slaughterhouses. And it appears that the status quo will be in place, at least until a further ruling of the Court. Another hearing is scheduled for some time in November. What Legal Arguments are the Israeli Religious Authorities Making? The Rabbanut’s theory also led to another interesting exchange. The Karaites argued that, in many significant respects, Karaite shechita is stricter than Rabbinic shechita. So the Court asked the Karaites whether it bothers them that the Rabbanites slaughter their meat with the comparatively lax Rabbinical standards in the same slaughterhouses. The Karaites responded that, of course, it did not bother them, because there was no likelihood for the knives and the poultry to get mixed up. Was the Court concerned that consumers would be confused between Karaite and Rabbanite meat? The Court *did* discuss the possibility of confusion that consumers face when understanding a kosher certification. For example, the Rabbanut suggested that the average Rabbanite, upon seeing the word kosher on a package of poultry slaughtered by Karaites, would be misled into believing that the poultry was kosher according to Rabbinical standards. My impression is that the Court did not place much weight on the Rabbanut’s argument. First, the Karaites pointed out that they label their meat as “Certified Kosher by Universal Karaite Judaism” clearly distinguishing their certification from Rabbinic certification. Another line of questioning by the Court focused on the fact that in Israel there are kosher and non-kosher McDonald’s, but Rabbanites are not confused. Religious Rabbanites know which ones are kosher or ask to see the certificate of kashrut. Similarly, religious Rabbanites should be able to distinguish between meat labeled as “Certified Kosher by the Rabbanut” and “Certified Kosher by Universal Karaite Judaism” despite superficial similarities. While I was preparing this article, Neria Haroeh, President of the Karaite Community of Israel, informed me that the Rabbanut changed its legal approach in this case. According to Haroeh, the Rabbanut initially argued that allowing Karaite slaughter at these independent slaughterhouses is against the Orthodox Rabbinical halacha; but the Rabbanut changed its legal theory to simply state that the presence of Karaite shechita increases the supervision burden on the Rabbanut. 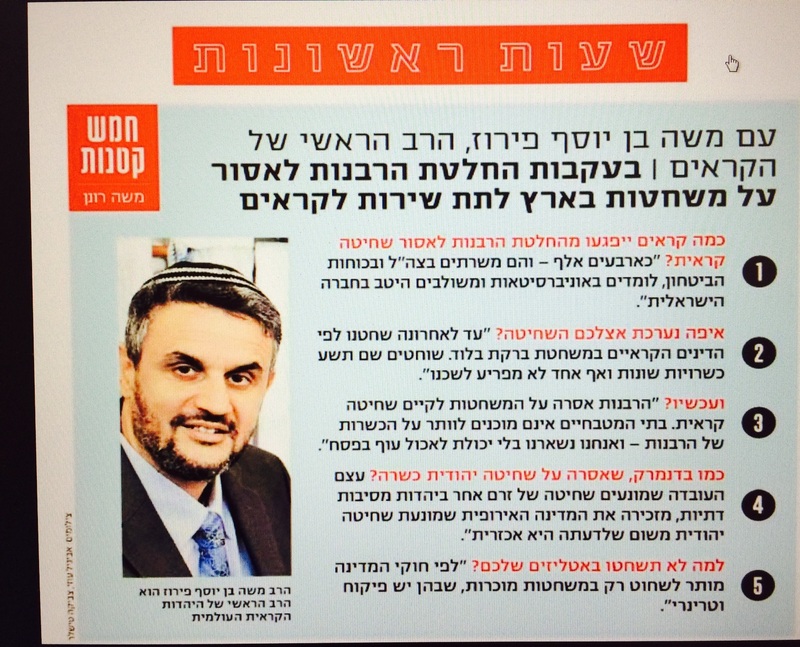 Rom Golan, the attorney representing the Karaite community of Israel, adds that the law which provides the Rabbanut authority to grant or deny kosher certification is a consumer driven law – that is, the law is not intended to promote Rabbinic halacha. According to Golan, the only purpose of the Rabbanut’s authority is to make sure that an Orthodox Jew does not believe that non-Kosher meat is Kosher. 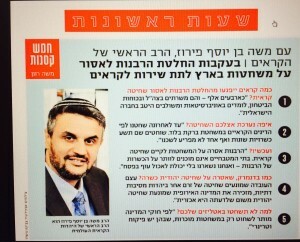 Golan believe that this underscores the lack of authority for the Rabbanut to act in the way they have in this case. I’ll be sure to tell people how this one shakes out as soon as I receive any information. The case is The Universal Karaite Judaism v. Chief Rabbinate of Israel (BAGATZ 2658/14). This is a fascinating commentary on the political nature of halakha in this day and age. Thanks, Shawn! it is interesting to see how The complaint was changed from its original premise. I like the argument of the Karaites about McDonald’s Kosher and non-Kosher food, a fact I was not aware of. I understand that the argument changed for two reasons: 1) it, in fact, is not against the rabbinic halakha; and 2) this is not a valid argument under the law. Interesting debate. I know that American Kashrut practices aren’t relevant in Israeli law but practically speaking the Kashrut authorities here routinely certify products in the USA from factories that produce both kosher and non-kosher products. It seems apparent that that is a political stunt on the part of the Rabbinute to insure it as the only legitimate Jewish authority. What was the final disposition of this case?